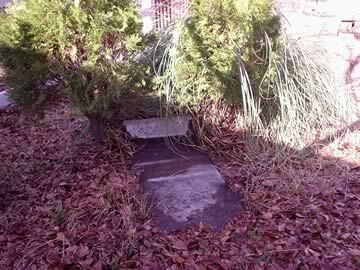 This cemetery is sometimes referred to as the Williams Rutherford cemetery, after Williams Rutherford whose wife and son are here. From the Baldwin County Courthouse, go east on Hancock St. one block. Turn right (south) on Wayne St., which becomes Business 441 South. Go 0.9 mile to the Vinson Highway (Hwy 112). Turn left on the Vinson Highway. Go 1.4 miles to Gilman St. Turn left on Gilman St. and go 0.1 to where the street forks and bear right at the fork on Jackson St. Go about 100 yards to the first street to the right, Davis St. Turn right on Davis St. The cemetery is located about 125 ft from the intersection of Davis and Jackson in the driveway of the first house on the right side of Davis, at 101 Davis St. SE (approximately 40 ft off the street). The brick foundation of the wall is visible, but the wall and all monuments but one have been destroyed. Son of Williams and Eliza Boykin Rutherford. Buried here, per will of Samuel Rutherford, Monroe Co. Courthouse. d. in his 17th year of age. "A youth of great promise." Gravestone is fading and difficult to read. d. in his 6th year of age Per TT. Cemetery is in decay.